Master the art of trading, combat and exploration in Elite: Dangerous a space simulation title with open ended and multiplayer gameplay where your own actions will impact on the story of the persistent universe. 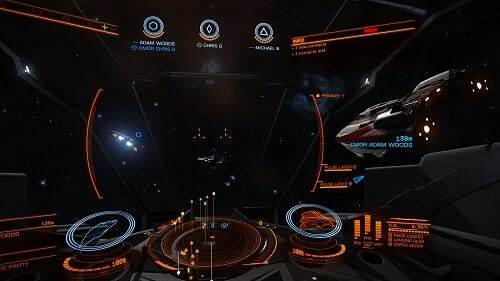 Launching in 2014 Elite: Dangerous started in the year 3300, which runs in sync with real time (making it 3302 in the year 2016). Borrowing on the primary game mechanics of the original (Frontier: First Encounters) players are thrown into the open galaxy with a spaceship and small stash of game funds where they can create their own space adventure path. Said path can involve trading, bounty hunting, piracy, assassinations and mining which of course range from legal to illegal which comes with its own set of considerations. All of these actions can be enjoyed in the single player mode or in the online Open Play mode. Borrowing from EVE Online this online mode recreates the harshness of life with actions such as stealing, extortion and even territorial control all allowed within the game. Regardless of your mode of choice you’ll explore the hundreds of billions of star systems that are filled with moons, planets and stars that have their own orbits and day/night cycles via procedural generation. Spread out throughout this expansive universe is plenty of outposts and large space stations which serve as hubs to accept quests, trade goods and upgrade your spaceship. 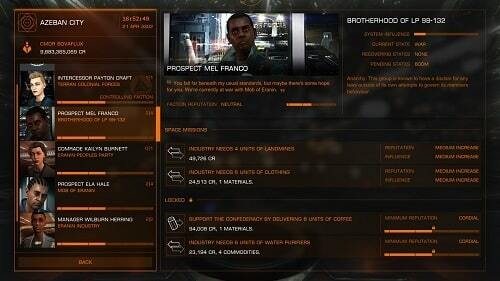 The presentation and amount of choice in Elite: Dangerous is the best assets that the game has to offer. Reaching the most impressive gear though is quite a grind so don’t be fooled into treating this as a single player game, as you’ll get there faster (and enjoy the journey more) with other players. Explore the universe by yourself or jump into online play. Adventure across billions of star systems. Customise your starship with your hard earned currency. Trade, fight,mine or become a pirate. A living game world where time advances along with day/night planet cycles.